Thanks to Scented for providing me with some free body products to review. There is nothing better than pampering yourself. That's why I really appreciate Scented. Scented offers quality bath and beauty products, which are perfect for doing some self-pampering. I actually, just recently, got a new job. It had been almost a year since I had last worked, and I had really forgotten how tired you get standing on your feet all day. Now that I am working, I am always tired, and I just like to take a few minutes to relax every day. So the samples I received to review have really helped me in the past couple weeks. I received 3 different 2oz samples to review. Including the Cherry Blossom Moisturizing Bath Salts, Fresh Squeezed Citrus Body Polish, and the Coconut Lime Verbana Body Creme. I've tried all 3 products, and really appreciate each one of them. 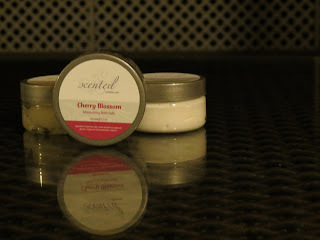 They all have amazing scents, of course, but my favorite scent, was definitely the cherry blossom. Not only did I love the scent, but I also really loved basking in the product in my tub. I try to take at least 1 hour a week to just sit in the tub, and relax, and this week, with the cherry blossom bath salts thrown in, I just felt even more pampered - Which I really needed. My second favorite of the 2 products (based only be scent) was the Coconut Lime Verbana Body Creme. I really love cremes, and I moisturize every single night. The final product was just as awesome as the others - I'm just not huge on citrus scents, but I didn't find the scent overwhelming or anything, I just preferred the other 2 a bit more. The product itself though, as a body polish, was great. I haven't really used body polish much in the past, so it was a pretty new product to me. After using the scrub, my skin felt more alive, and it felt like it was able to breath a little more - It's amazing how using such a gritty texture on your skin, can work miracles. My skin was "scented" and felt very alive, and renewed! 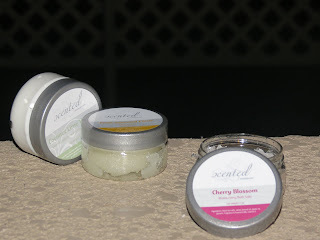 Overall, I enjoyed all 3 of the products I received, and if you are in need of a bit of pampering or know someone who is, definitely check out Scented for yourself - Scented products make amazing stocking stuffers :)! Disclosure: Review product was provided to me free of charge. All opinions expressed within this post are my own, and were not influenced in any way. Must be 18 years or older to enter. NO PURCHASE NECESSARY. 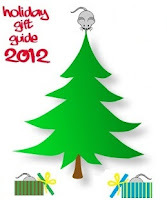 This giveaway starts on December 1st, and will end on December 16th, 2012. Winner will be drawn via Random.org via Rafflecopter, and announced on top of the Rafflecopter form, as well as on the top "Winners" page. The winner will be emailed and will have 48 hours to respond to my email before a new winner will have to be drawn. If you're tweeting for entries, you must have an "unlocked" account. The number of entries received determines the odds of winning. VOID WHERE PROHIBITED BY LAW. I'd like to try the fresh squeezed citrus bath salts. I'd like to try the Vanilla Citrus Body Polish. 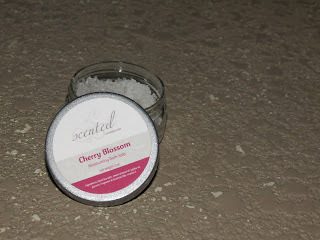 Cherry Blossum would be my favorite - Great post Amanda. I'd love to try the bath salts in lavender vanilla! I like the Kiss My Lips lip balms. Fresh Squeezed Citrus Bath Salts sound yummy to me!